HF: The Po Lin Monastery website provides additional information to that provided in the paper published in The Structural Engineer, Vol 73, No. 17, 5th September 1995 sent by IDJ and linked below. The design of the statue was based on the 32 laksanas, that is, “physical marks” of the Buddha as described in the sutras. 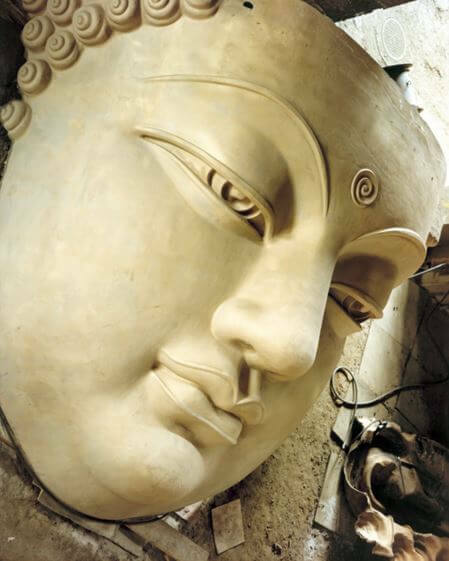 The face was modeled after the Buddha Vairocana of the Longmen Caves for its fullness and serene beauty. The clothes and headgear had their inspiration from the soft and smooth flowing lines of the Buddha Sakyamuni image in Cave 360 of the Dunhuang Grottoes. The statue was therefore a culmination of the characteristics of sculptural art of the Sui and Tang Dynasties when Buddhism was at its prime, skillfully mastered and conceptualised by the artist to shape the perfect design of the Buddha statue that we see today. 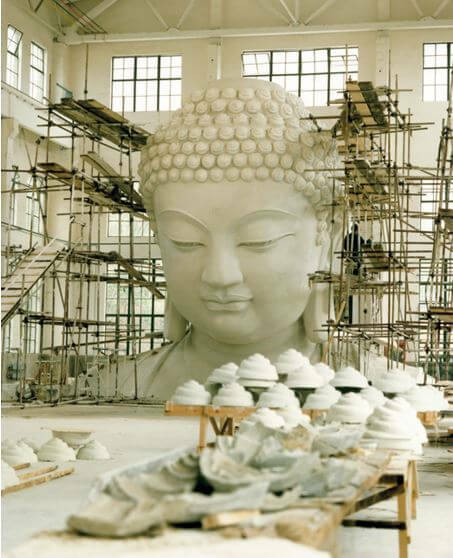 The original idea was to use reinforced concrete for the building of the Buddha statue. However, due to artistic requirements, structural problems, as well as the anticipated difficulties in quality and cost control, bronze was finally chosen as the building material. The actual casting, finishing and assembly of the Buddha statue were principally carried out in the Nanjing Chengguang Machinery Plant of the China Astronautics Science and Technology Consultant Corporation. The project was divided into six stages. Design, Enlargement, Casting, Trial Assembly, Transportation and On Site Assembly. In the stage of overall project design, over 5,000 drawings and 300 technical documents were produced within less than three months. The daily and monthly work progress for the subsequent three years was mapped out and prepared by system analysis. 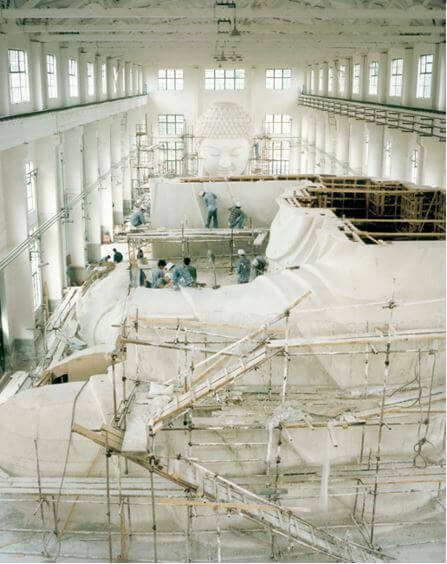 The 1:5 scale (about 5 meters high) plaster model of the statue was shipped to Nanjing from Guangzhou on 26 September 1986. The body of the statue was to be cast in bronze pieces supported by an inner framework and fixed by connecting bolts. The main framework was made of steel and auxiliary supports were used to connect the bronze pieces to the main frame. The trial assembly was carried out in the plant rehearsing for the on site assembly. Any problems that might occur on site were detected and solved in the plant. The bronze pieces were transported to Hong Kong by sea in April 1989. 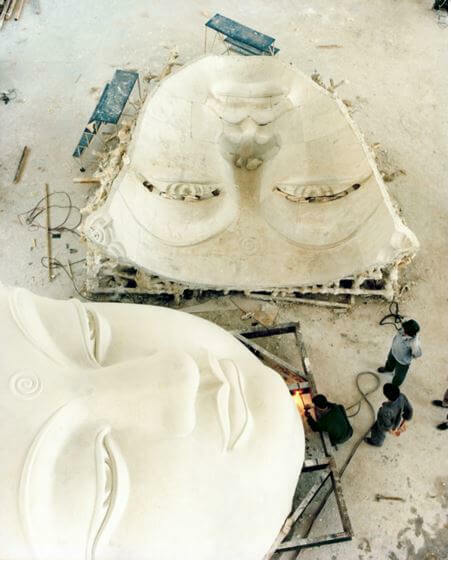 As the face of the statue was very large and the roads on Lantau Island were winding and narrow, there were acute technical problems in transporting the face piece up to Mount Muk Yue. 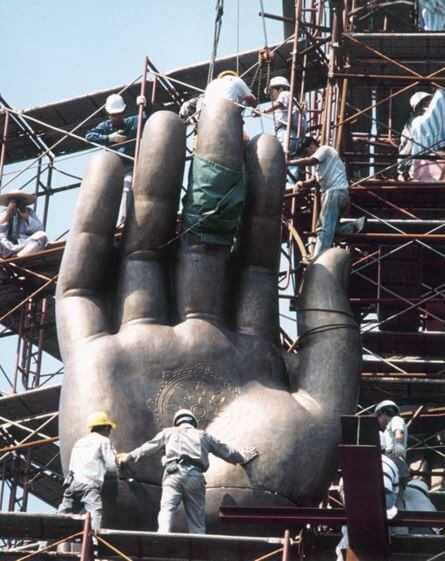 The assembly and welding of the statue were carried out from bottom upwards in eight layers. The length of weld was over 5 kilometers. As all the work had to be carried out in open air, one could well imagine how arduous the task was. The inaugural ceremony of the Big Buddha was held on 29 December 1993. This article was first posted on 3rd December 2015.